For the first time, I am going to have to pack a lunch for my daughter this year where the teachers won’t heat up food for her. (I know, I’ve been spoiled.) So I’m soliciting advice: what are the best thermos-type containers for lunchboxes? She’s just a preschooler, so she doesn’t have a huge appetite. I’m supposed to try to send milk, too! Help! Meanwhile, here are some great lunchbox ideas in addition to the prepackaged goodies we shared last week. Homemade Spaghetti-Os with Sliced Franks are a great, homemade alternative to the canned version. This recipe freezes easily, so make a big batch and freeze in small portions. Then heat one portion the morning you’re packing the lunchbox and put in a thermos container to keep warm until lunchtime. Likewise, these Toddler Thai Noodles, with kid-friendly peanut-butter sauce, freeze well. This is an excellent meal for kids with dairy intolerance or allergies. And to make it gluten-free, simply use rice or a gluten-free pasta. 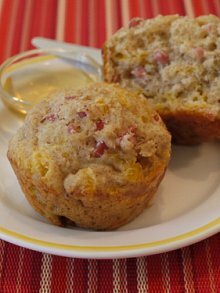 If you don’t want to send a hot meal, these Ham and Cheese Muffins might fit the bill! They have protein and dairy all wrapped up in a whole wheat muffin for small hands. I’ve even added a little pureed corn for a vegetable component. My kids won’t eat corn kernels … but I don’t mind hiding a little nutrition now and then. 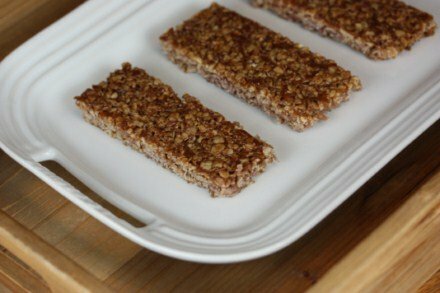 Homemade granola bars are a good way to think outside the sandwich box for lunchtime. Some of our favorites are these Crunchy Granola Bars, Peanut Butter Pretzel Chocolate Chips bars, and Chocolate Coconut Oat Bars. What do you like to pack in your kids’ lunches? Thanks for the homemade suggestions. I’ve got my first year of packing school lunches ahead of me so I’m collecting ideas. I’m intrigued by the ham and cheese muffins.